Adrienne Simpson took this when Craft Distillers was shooting video for their mezcal DVD. 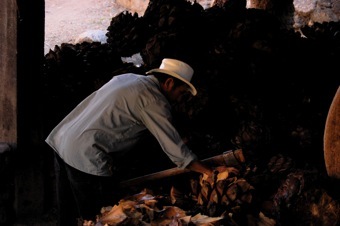 The agaves, or “magueyes” as the locals call them, have been roasted in a fire-pit to a deep mahogany color and are being cut into smaller sections to be crushed in a stone mill, prior to fermentation. You can tear off a small piece, still warm, chew, and let rich fragrant fresh-roasted agave nectar flow slowly down your throat: it’s beyond delicious, and it’s why artisan-distilled mezcal is so nicely sweet: richer than the sugars and/or caramels added to almost all other distilled spirits after they have been distilled. November is “rareties” month, so we turn to artisan mezcal distiller Joel Antonio Cruz, out in the middle of Oaxacan nowhere (San Juan del Rio, 20 miles on dirt roads from the highway). He distilled a single batch combining wild agaves (“Tobala”: folks go out in the mountains and find them, like collecting wild mushrooms) with another rare variety called Tepeztate. This perfecto batch is 130 liters = 190 bottles only. It’s wonderful stuff, rich and soft, mouthfilling, slightly sweet from roasting, with a mildly feral tang. Mezcalero San Juan del Rio, 750ML, 45.6%abv, $84.00. The San Juan is first in a planned series of mezcal bottled under a new label, Mezcalero: single batches from talented individual distillers from a region making world-class spirits that are almost entirely uncommercialized. We shot a DVD about what artisan mezcal is, how it’s made. Email and ask us for one and we’ll send it to you. Here’s something unique & high quality at a very reasonable price: a 1994 wedding was cancelled after we had assembled a custom blend based largely on Chenin Blanc, a varietal that has more or less disappeared. Germain-Robin Barrel Blend 1994 in half-bottles (375ml, $50.00).